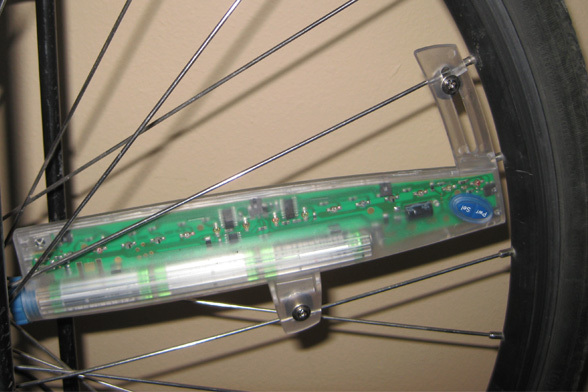 Hokey Spokes are transparent computerized “blades” that attach to your bicycle spokes and spin as you ride to create an impressive array of design images and text. With a name like “Hokey Spokes” you might expect these little electronic “blades” to be nothing more than a children’s today. However, you’d be surprised to learn just how impressive these little lights really are. Right off the bat, it’s easy to see that the Hokey Spokes products are unique. On my very first ride around my neighborhood with the lights mounted on my front wheel, I got a number of comments and strange looks from people passing by. Few people have ever seen a bicycle light up the way that it does with the Hokey Spokes in use, and that alone, I believe, will have a few individuals rushing out to get these unique LED blades. Another great thing about Hokey Spokes is that the designs are pre-programmed into the device. While there are other/similar products on the marketplace that allow you to create customized designs, Hokey Spokes are beautiful and easy to use – without you having to do a thing. For those who do want to further customize their ride, Hokey Spokes give you the option of programming in your own custom text message. The directions for text customization come right on the back of the packaging and are incredibly easy to follow. You can program in any text you want as long as it is 16 characters of less and you are happy with the text displaying in all capital letters (and no, you can’t choose the font of your choice). Sadly, Hokey Spokes are expensive. Really expensive! While it is recommended that you use at least 3 blades on each wheel in order to get the designs to display properly at low speeds, the blades are sold individually and cost between $29.95 and $39.95 USD depending on what color blade you select (Blue, White, and Rainbow colored blades cost the most, while green, yellow, red and orange cost the least). Nevertheless, some quick addition shows that even if you were to purchase the very cheapest of blades, you’d be looking at approximately $89.95 per wheel (or $179.70 in order to outfit a standard two-wheel bicycle). At that price, I’m afraid few people will jump on this particular product. While overall very easy to install, Hokey Spokes are a bit of a pain to take on and off the bike. You do need a screw driver in order to install or remove the product and this does take some time and practice. Unlike many front and rear bike lights that snap on or off with the flick of a button, Hokey Spokes take a bit more work. On my first ride around the block with the Hokey Spokes in place, I noticed a small rattling noise coming from the blades and feared that the product might wiggle itself off the spokes and go flying out into the street and be destroyed. However, I quickly thereafter realized that this rattle was cased by the batteries inside the blades and not by some lose connection between the blades and the spokes of my wheel. As Richard from Hokey Spokes informed me via email, “The sound of the rattling may be the batteries. We had to design the dimensions of the battery cavity to allow for variances in AA batteries around the world or else some of them (slightly over sized) might stick inside. If you are bothered by this you may do one of two things: 1) You can take a strip of Scotch tape and run in along one side of three AA batteries and slide them in together as one longer battery. This will quell the rattling. Or, 2) you can untwist the brass piece on the blue battery cap, put a metal washer on the stem and reassemble. This will have the effect of putting more pressure on the batteries and tighten their assembly in the battery chamber. Both of these comments are mentioned on our “Frequently Asked Questions” of our website.”. Finally, I have to mention the fact that Hokey Spokes can really only be used at night. During the day the lights just simply don’t show up. And because I usually do very little night riding (and because I suspect other bike riders try to avoid riding in the dark if they can), I believe some cyclists will find it difficult to find a time to actually use these products. Despite the list of dislikes mentioned above, I believe that Hokey Spokes are a fun, unique and reliable product. If the price of the products were cut in half, so that you could outfit at least one wheel for about $40 – $45 USD, I think that would result in a huge increase in sales. In the meantime however, I find the price to be a bit restrictive. My Rating: If I had to rate Hokey Spokes on a scale of 1 to 10 (without considering the price), with 1 being the worst and 10 being the best, I’d give it a 7. There is nothing actually wrong with the product other than the fact that you can only use it during the night – a time of day most cyclists try to avoid if they can. This entry was posted in Bicycle Touring Pro Articles, Electronics, Lights, Main Articles, Product & Service Reviews, Products, Safety, Tech and tagged bicycle lights, bicycle spoke lights, crazy bike lights, custom text, for the person that has everything, hokey spokes, hokeyspoke, unique bike lights, unique gifts. Are you familiar with the Monkey Light? If so, how would you compare these to the Monkey Light (https://www.monkeylectric.com/m132s.htm)? I’ve never used Monkey Lights before, so I really can’t say. Maybe someone else has used them and can give you their opinion? BTW… in this review I don’t think you mentioned if you bought the item in question or if it was sent to you for a review. Can you clarify that on your future reviews so we can take it with a grain of salt if needed. Thanks! Thanks for pointing out your policy. I hadn’t realized that the products/stuff you reviewed or promoted were received for free unless noted otherwise. I had started to think of your site as a source for unbiased info on cycle touring but now that I know your policy and for-profit nature I’ll take future reviews with a large grain of salt. Thanks for being honest when asked. In fact, I’ve negatively reviewed several products here on the site (I’ll link to a couple recent ones below). The products sold on my site through the “store” are products I use and strongly believe in. Other products, like the Hokey Spokes I’ve reviewed here, are simply items I have received for review. That is all. Again, I don’t say something’s good unless I think it’s good. And I don’t say something is bad unless I think it’s bad. There are some companies/websites that write about and review products they have never even used. I, at least, take the time to use a product before I write about it. I can’t give my honest opinion on products I have never used. And that’s exactly why I was unable to give you my opinion on the Monkey Lights you asked about. I’ve never used them and therefore have no opinion. To me at least, that’s the way it should be. No grain of salt needed. Thank you for your review of Hokey Spokes. As for your concerns, we have lowered the price for Hokey Spokes and are running a Buy Two-Get One Free which brings the unit price on all colors down to $20 each. We realized there was a price barrier and worked hard to find more reputable vendors with lower prices. For example, in 2005 we were paying 38 cents each for Blue LEDs. When I asked their sales department for a price quote on 500,000 Blue LEDs, he said “38 cents each!” We found another supplier for much less. Same is true with the White LED’s which were 58 cents each but now we are paying the same price as other colors and the retail price reflects the savings. Sorry you cannot see them during the daylight hours but my LED flashlight does not work so well during the day, either. But then again, I don’t need it during the day. Thanks again for your comments. We do pay attention to evaluation and feedback for quality control adjustment and fixes. Last night I discovered this product concept after playing with a spinning light toy that creates a circular flower/mandala pattern. I thought it would be cool to have spoke mounted LED’s and wondered if a product existed. I saw the MonkeyLectric.com site first and was really impressed. Their lights are more than twice the price, but appear brighter in their videos. Their are even shots of the lights working in daylight. Though, it does look like lower-light times of day rather than full-on midday Sun with clear skies. I’m torn between getting the MonkeyLectric product which looks really good judging from the video or saving a LOT of money and getting Hokey Spokes. I could outfit both front and rear wheels with 3 Hokey Spokes each for the price I would pay for 2 MonkeyLights on 1 wheel. Oh, also the MonkeyLights have a big variety of colors in each LED. Unfortunately, I had some hokey spokes and the product doesn’t work. Yes, the batteries rattle inside A LOT. In addition, since there is no mount point near th hub, any road vibration causes the whole assembly to rattle around. And as a result of all this rattling and vibration, mine started turning themselves on and off. The product doesn’t appear o have been road tested at all. It works great spinning in my garage. I see some of my friends are getting anvii wheel lights and wheel AD for X’mas. I’m getting mine too. To me, anvii provide a software program taht compatible with XP, Win7 and Win8. That’s super easy to use. This is what really makes me to pick up anvii after comparison. Sad part is they don’t have MAC version. Hope they can make them very soon. BikeParty! Yaya! These are going to be perfect for the monthly BikeParty here in Sacramento, CA! Ordered mine yesterday. They are running a deal on the rainbow Hokey Spokes, $10 off per unit so they are only $20 each! Go get them at the offical Hokey Spokes website for the deal and find yourself a BikeParty in your area! Google “bikeparty” it you don’t already know. There are plenty of times to use them. Bike Partyyyy!